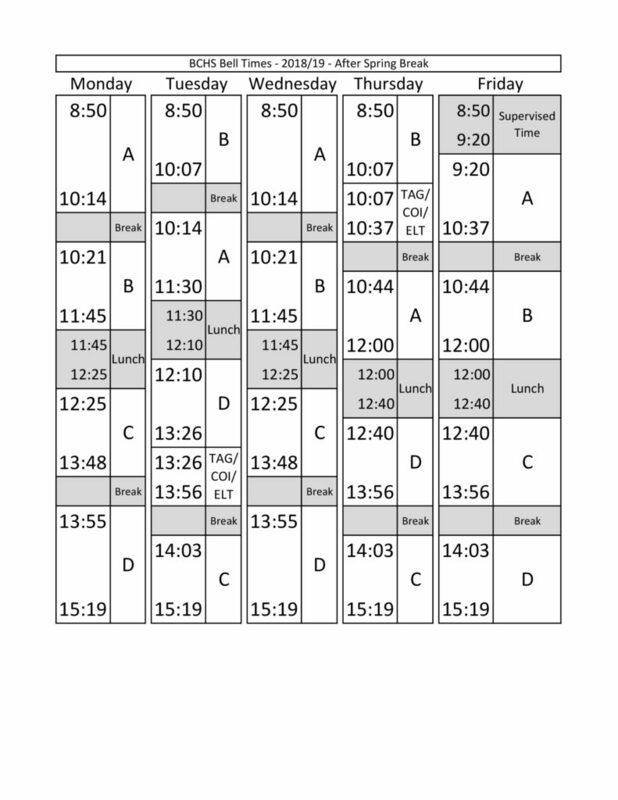 Most days at BCHS start at 8:50 am and end at 3:19 pm. All Fridays, classes start at 9:20am. Lunch on Mon and Wed is from 11:45 am – 12:20 pm, and Lunch on Tues is from 11:30 am – 12:10 pm, Thurs and Fri is from 12:00 pm – 12:40 pm. On Early Dismissal Wednesdays, classes run from 8:50 am – 2:19 pm, and Lunch is from 11:14 am – 11:54 am. For the Jr. High schedule, we will alternate between Week A and Week B for the entire year to allow for balancing of the overall class periods for subjects that occur every second day.